The Body-Energy Clock is built upon the concept of the cyclical ebb and flow of energy throughout the body. 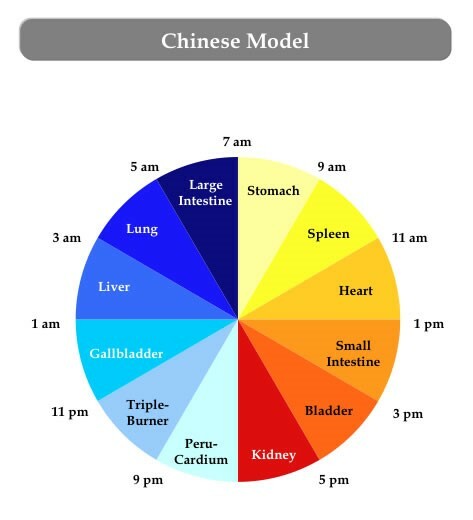 During a 24-hour period (see diagram that follows) Qi moves in two-hour intervals through the organ systems. During sleep, Qi draws inward to restore the body. This phase is completed between 1 and 3 a.m., when the liver cleanses the blood and performs a myriad of functions that set the stage for Qi moving outward again. crests at midday. Eating larger meals of the day early delivers nourishment to the small intestine when it is strongest, which aids absorption and assimilation. Liver: The liver stores and cleanses the blood, a fact that becomes more interesting as we consider personal experience. Have you ever partied too much in the evening, and awakened in the wee hours of the morning feeling “off” and unable to fall back to sleep? Chances are good that you were tossing and turning between the hours of 1 a.m. and 3 a.m. when your alcohol over-loaded liver was struggling to do its work. The timing of the liver’s peak activity also speaks to consuming the last meal of the day as early as possible. The liver’s daily programming assumes an early dinner and bedtime. Before electricity and the light bulb, people ate supper and retired early, allowing time for the last meal of the day to digest so that the liver could be most effective in its peak hours of activity. The “work shift” of the liver, then, reinforces the concept of making the last meal of the day a light one that is consumed on the early side. The more time that passes after food is eaten before peak activity of the liver, the better the liver will be able to carry out its myriad of functions.